Capt. 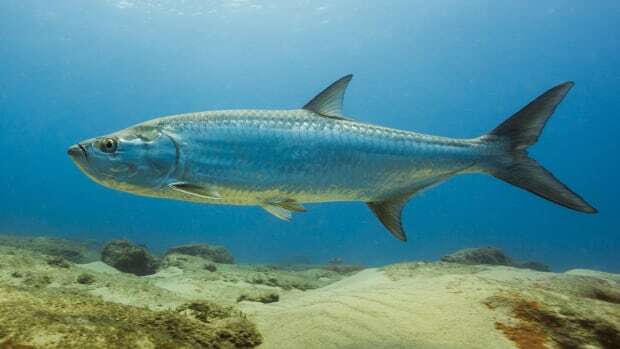 Steve Quinlan says respect for large makos is essential for the safety of both sharks and anglers. After killing an enormous 1,175-pound fish a decade ago (below) Quinlan had a sea change and began running catch-and-release charters. Capt. 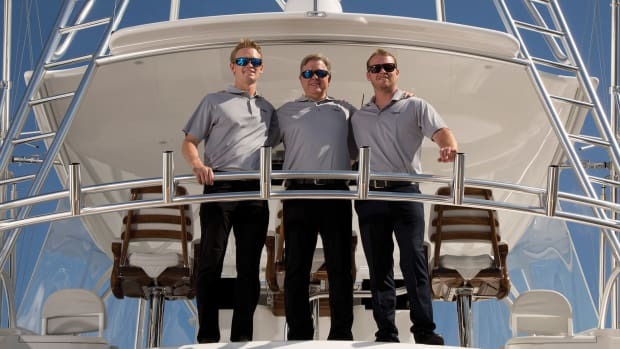 Steve Quinlan’s 29-foot center console, Strike Zone, has the look of a well-worn chew toy. Both sides of her once-gleaming white hull are tattooed with crosshatched patterns of teeth. Several of these wounds cut clean through the gelcoat, right down to the underlying fiberglass. He remembers with fondness the occasion of every gash and gouge, once pointing out with glee the saber-like tip of a mako tooth stuck into the hull, just below the gunwale. “When I grabbed the leader, that fish went berserk, turned her head to try to take a chunk out of me,” says Quinlan, who is 57 and from Long Beach, California. “Ended up getting a mouthful of boat instead and broke that tooth off for her trouble.” I never asked him, but I’d wager he shed a tear when that tooth finally fell out. 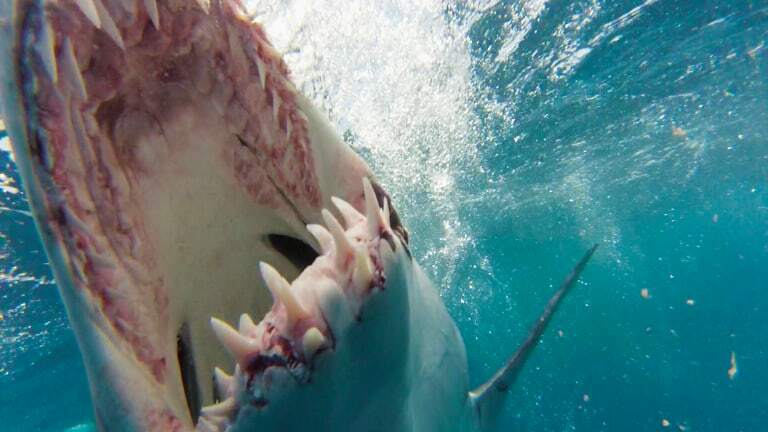 A big mako, lured by fresh-ground fish, blood and oil reaching across miles of water, will charge into a well-laid chum slick like a meat-seeking missile. (Quinlan won’t divulge the exact chum ingredients.) Sometimes you’re tipped off to their presence. Other times they appear out of nowhere. However they arrive, they’re usually pissed off, hungry and more than a little bit crazy. I was the first to see the estimated 800-pound mako that came to the boat on a recent summer trip. I found myself incapable of sensible speech. 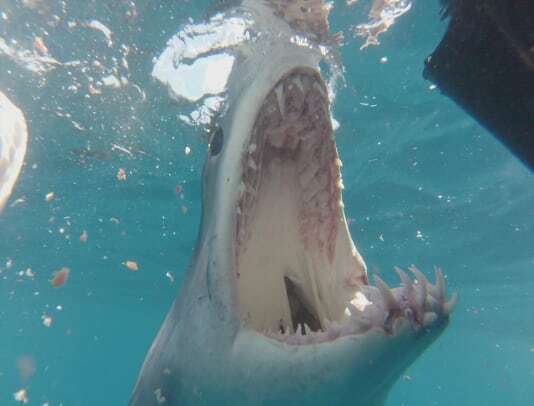 The mako was by no means the first or even the biggest shark I had seen up close, yet her sudden appearance left me unable to utter anything more eloquent than a string of F-bombs. As Quinlan readied his heaviest outfit with a leader and large slab bait — and buckled my son Gregory into a stand-up harness — the deckhand and I filmed video above and below the surface. We giggled like kids as the shark swam around with her massive head out of the water and her mouth agape, biting down on the transom, chewing the engines and banging her head against the propellers so violently that we could hear the clang from inside the cockpit. 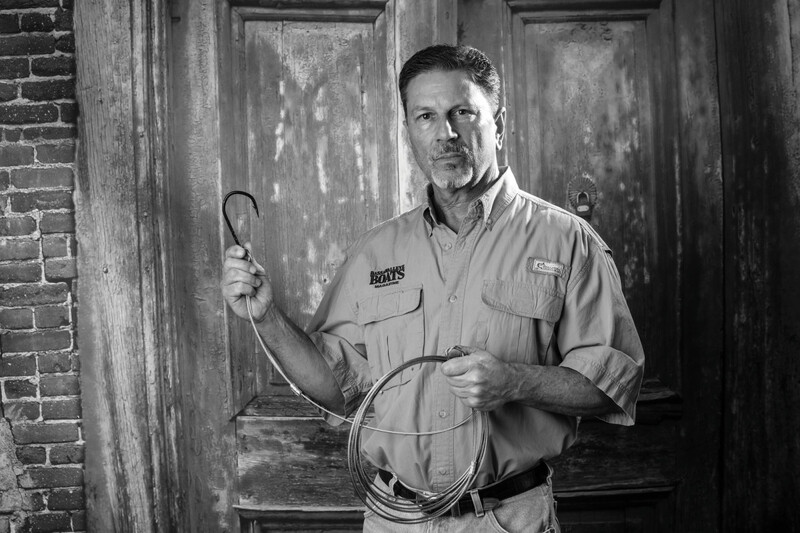 Once Greg was buckled in, Quinlan grabbed the coiled, 30-foot steel leader in his right hand. He tossed leader and bait like a lasso behind the boat. 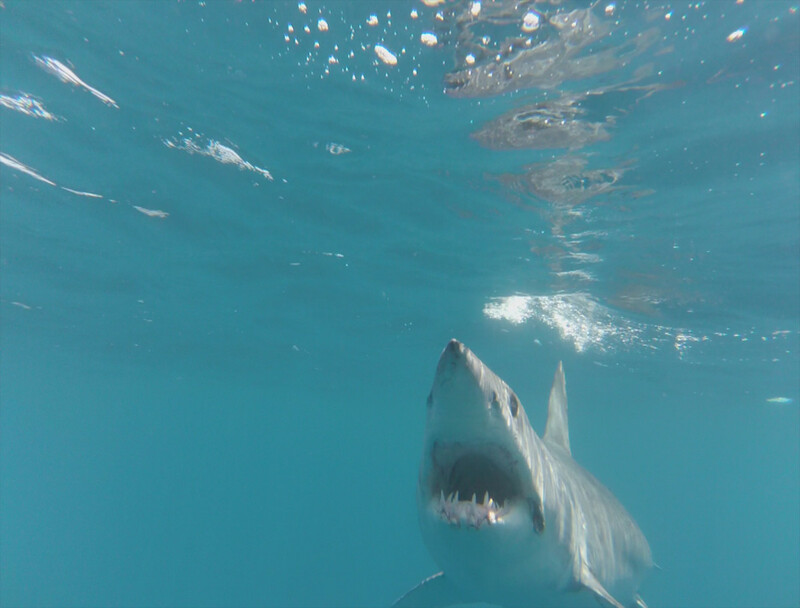 The shark, still happily chewing away on the Mercury Verado outboards, didn’t break off to investigate the bait. She threw us a curveball instead, raising her head clear of the water and chomping down on the 800-pound steel cable leader, just below where it was joined to the 80-pound monofilament. We stood silently for a few moments, thinking, What the hell do we do now? If the fish became tail wrapped, we’d be in a fight we didn’t want and couldn’t win. Fortunately, the leader slid through her jaws, and the hook lodged in the corner of her mouth, allowing us a relatively fast two-hour catch and clean release. I’ve spent dozens of hours chasing monster makos with Quinlan, and hundreds more hours recounting the adventures over a few cold brews. What strikes me is how Quinlan can recall details of every battle — the personality of every monster he’s fought. And he’s fought plenty. 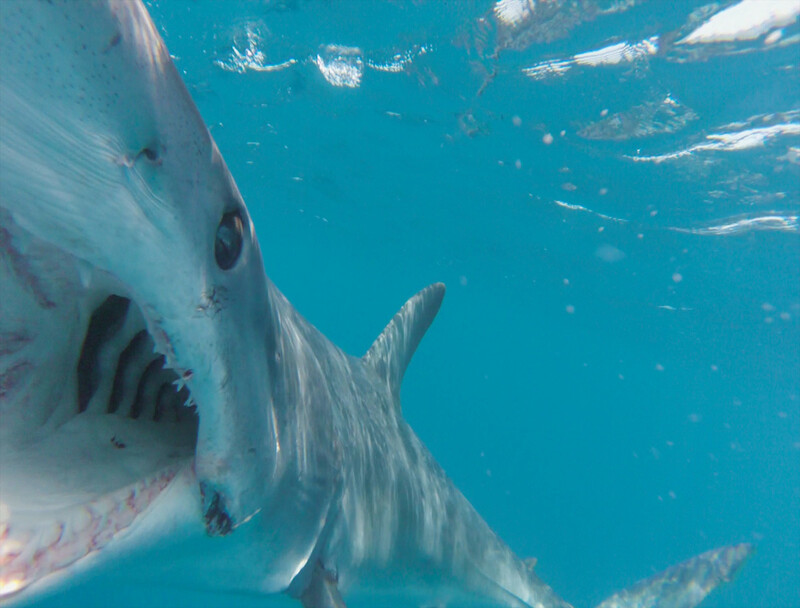 Quinlan has guided anglers to the capture of 10 mako sharks over 1,000 pounds, and more 700-plus-pound fish than he can count. In one run during the summer of 2013, Quinlan’s customers hooked 1,000-pound-class makos on seven consecutive trips. Five of these were landed and released after battles lasting from an hour and a half to four hours. Two of the other makos found a way — as they often do — to release themselves through trickery, cunning or overwhelming force. Catching a grander (a fish of 1,000 pounds or more) would be a once-in-a-lifetime accomplishment for most captains or anglers. The fact that Quinlan has repeated this feat several times in a single season proves two things: Southern California has the best trophy mako fishery in the world, and Quinlan is singularly dedicated to the pursuit of catching big mako sharks. He calls his laser focus a “monster mentality.” The trophy-or-nothing mindset pervades everything he does, from the chum he grinds to the offshore canyons he targets to his strict adherence to sight-fishing tactics. He developed and fine-tuned these techniques to garner first-place finishes on Southern California’s once-robust mako tournament circuit. He quickly gained a reputation as a top captain, winning local club events and national tournaments, and appearing on the reality shows Shark Hunters and Shark Hunters East vs. West. And yet, even as he was winning and earning fans, deep inside he was souring on the idea of catching and killing big sharks. 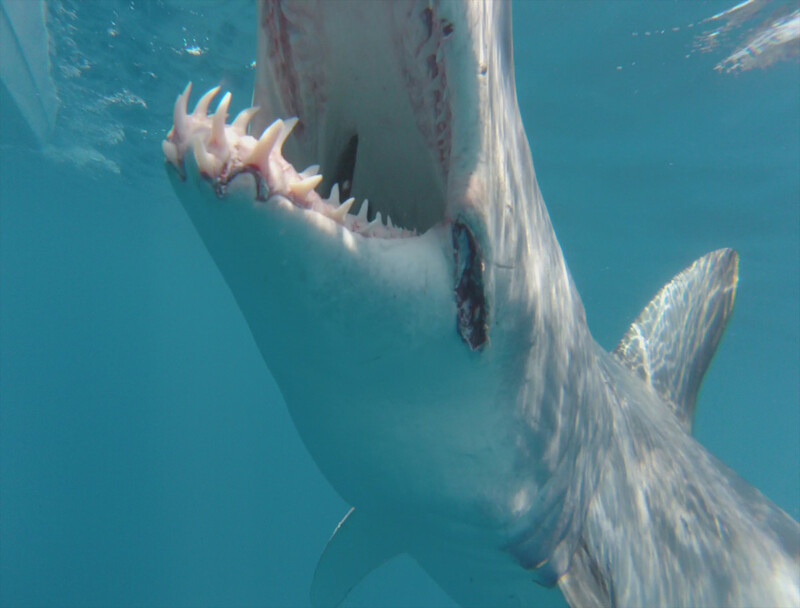 Sometimes, two big fish would die at his hand during a weekend tournament — the very broodstock needed to help sustain the great fishery, as large mako sharks are almost exclusively female. In retrospect, the mako tournament scene was macho bloodsport at its worst. As tournaments grew in popularity and frequency, boats would wait in line to string up dead sharks to the oohs and aahs of crowds on the dock. To its credit, the angling community realized change was necessary, and the tournaments ended. Quinlan, of course, keeps fishing, now for the thrill instead of for the glory. I still remember the Sunday morning 10 years ago. I was sitting in church when an incoming text buzzed my pocket: “Coming in with a monster fish.” A few minutes later: “Possible world record.” Before the service ended, I received a final text with just the numbers 1175. At the time, this certified 1,175-pound mako was the largest fish at the time ever caught on rod and reel on the West Coast (though just shy of the all-tackle International Game Fish Association world record at the time of 1,225 pounds). 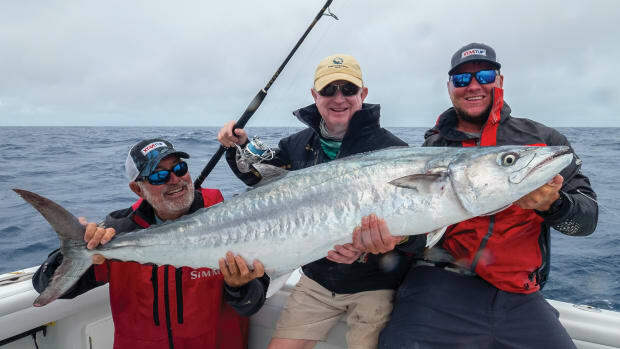 It didn’t help that the anglers on his boat — business associates, not charter customers — had passed the rod around, disqualifying the catch from world-record consideration. 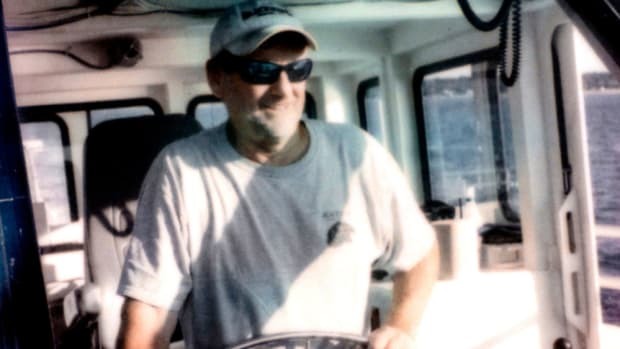 They implored him to be evasive about how the fish was caught, something he never considered, says Quinlan, who was an editor of outdoor newspapers and magazines before he became a charter skipper. The situation devolved to the point that a passenger and Quinlan ended up in court over ownership of the shark’s massive jaws, a suit Quinlan won. 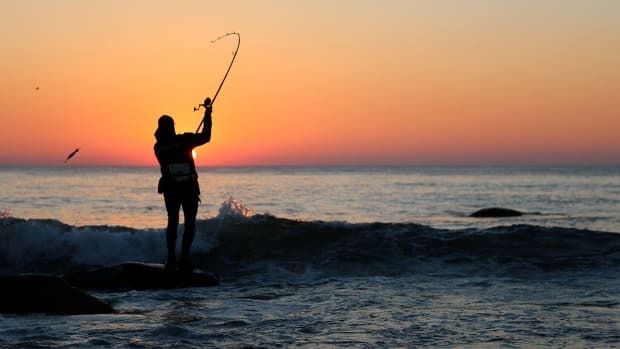 What began as a fun day taking buddies out fishing ended in a legal battle over calcified cartilage. 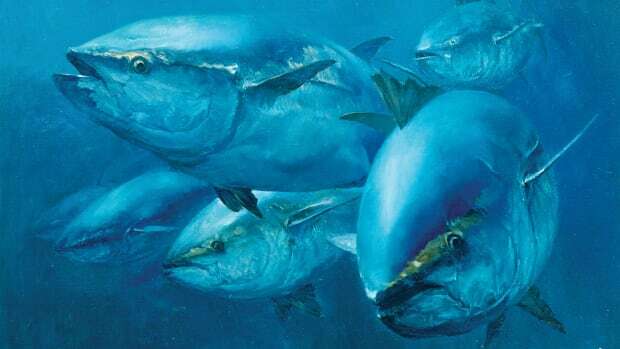 That one fish and the ugliness that followed permanently soured Quinlan on killing and weighing large, breeding makos. 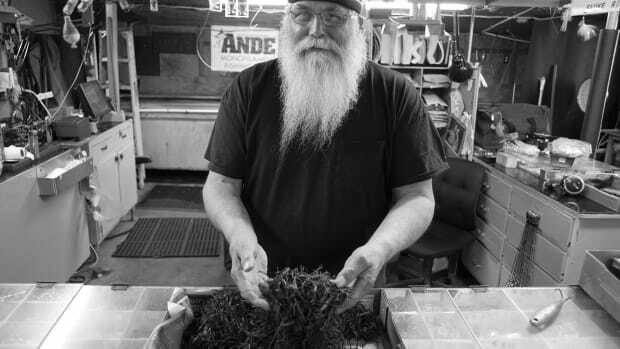 Instead, he adapted his techniques to catch and release, and he established a charter business that draws like-minded anglers from around the world. And the experience of harvesting that fish and verifying its exact weight provided Quinlan with a unique benchmark to estimate the size of other monsters once he has them alongside the boat. During the past decade of running catch-and-release charters, Quinlan’s customers have caught several fish he has estimated to be larger than the 1,175-pounder. One stands out. Professional poker player and day trader Dominik Kulicki traveled from the Netherlands to catch a monster, and the 13-foot, estimated 1,300-plus-pound mako he landed is still the largest Quinlan has seen. Kulicki took this challenge seriously, training like an athlete for what would be a four-hour fight. Other clients have stories they find equally thrilling. The Carter family from Utah, Quinlan says, has chartered with him six times, landing fish estimated at 1,250 pounds, 1,200 pounds, 1,000 pounds and 800 pounds, among other catches. Nonetheless, Quinlan says he talks the vast majority of would-be clients out of booking a charter. He screens them carefully, beginning with their pledge that they must be willing to release a giant and come home with just video, pictures and one hell of a story. He also provides anglers with official IGFA Catch Certificates to commemorate their achievements. To induce patience, Quinlan recites this motto: “When we’re chumming, we’re fishing. 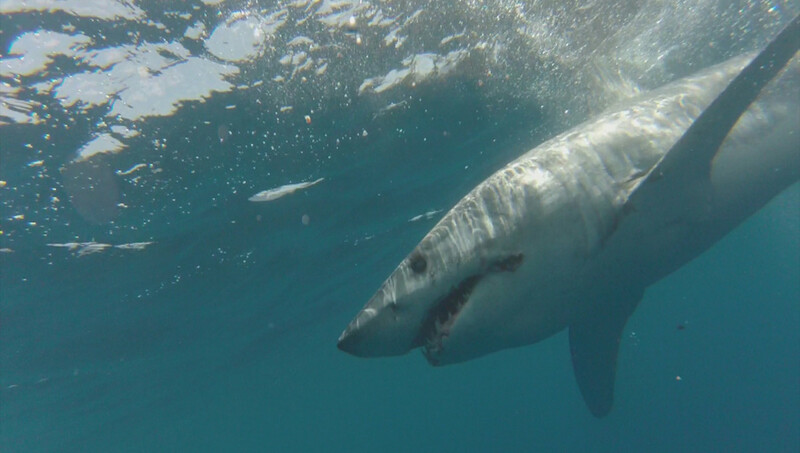 Rather than focus solely on sea surface temperature breaks, Quinlan understands that the biggest sharks use Southern California’s deep-water peaks and canyons as feeding lanes. He spends days before each trip searching satellite sea temperatures for pockets of 65- to 71-degree water surrounding key bottom structure areas. Fertile hunting grounds are often within an hour’s run of popular Southern California ports, including San Pedro and Marina del Rey. Once he reaches the target area, he observes the wind and current and uses his plotter and high-resolution bathymetric charts to set up the optimal drift. If it’s a deep-water canyon, for example, he will position the boat to spread his chum slick down the length of the canyon, optimizing the chances of intersecting a shark patrolling the feeding lanes. After an hour or two, it’s common to have a string of sitting birds marking your chum slick like traffic cones. The crew’s primary job, aside from making sure the chum supply is replenished, is to watch for signs of incoming sharks. Most often, the birds are the first indicator. It’s not unusual to chum all day only to have a monster show up at the boat at 3 or 4 o’clock in the afternoon. 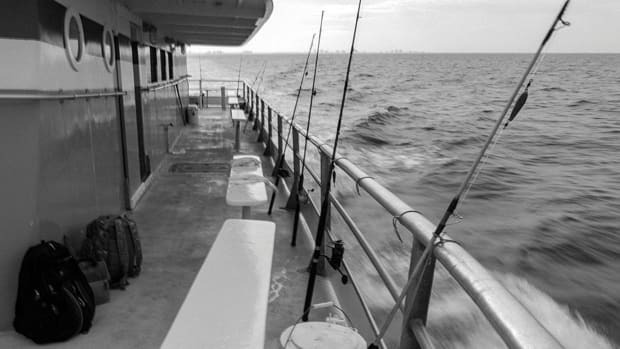 When that happens, the captain and crew have to make a difficult decision about how much daylight is left and whether it’s responsible to bait that fish up. Quinlan says he tries to avoid battling big fish at night for safety reasons, though he fought fish through the night when he was fishing tournaments. The act of hooking and fighting a large mako is a team effort, and the skipper is the captain of that team. The angler handles the rod while the leader man assists the angler and constantly updates the captain about what the fish is doing. A lapse in attention or a mistake by any member of the team can result in a lost fish or serious injury to the crew. Makos are known for dogged runs and acrobatic leaps. Seeing a 1,000-pound fish propel itself into the air, complete a somersault and crash back into the sea will raise any angler’s pulse. It’s when they get close to the boat, however, that things get truly exciting. Even an experienced crew gets edgy. For this reason, the boat is constantly moving forward during the fight. This keeps you mobile and prevents a big shark from running under the boat. Makos can swim in bursts greater than 45 mph. More than once, I’ve seen Quinlan gun his twin outboards to run away from a charging shark intent on getting underneath us. Once the fish begins swimming steadily on the surface with its dorsal fin out of the water, you can start to parallel the shark with the boat. You close the distance until you have the shark alongside the boat, and then, without taking any wraps around his wrist or hand, the leader man brings the leader into the boat until the shark is in within reach. Depending on a variety of factors, from how green the shark is to where the fish is hooked, Quinlan will use either a long-handled device to remove the hook or heavy-duty cable cutters to cut the leader at the hook. 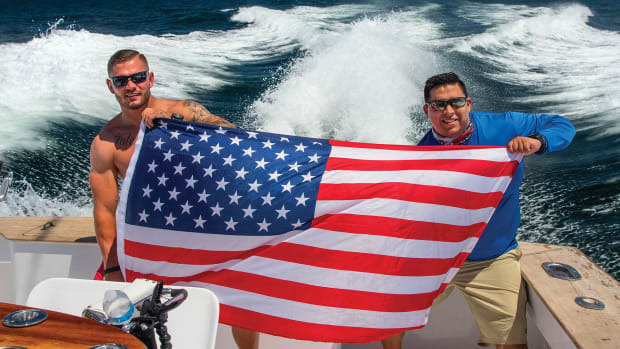 How a former Marine is helping veterans cope with the ghosts of war, one fishing trip at a time.